Gift the monitor and keep the gift card for yourself. 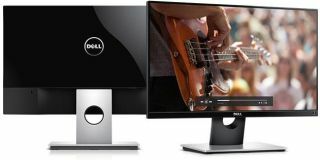 Dell has been cranking out some monitor deals as of late, everything from an UltraSharp 34-inch curved ultrawide for $600 to today's bargain for a 23-inch IPS monitor (S2316H) for $130. To sweeten the pot on today's deal, Dell is tossing in a $75 gift card with purchase. This a Full HD 1080p (1920x1080) monitor with a 60Hz refresh rate and 6ms response time (gray to gray). It also features an 8,000,000:1 dynamic contrast ratio (1,000:1 typical), 250 nits brightness, and connectivity options consisting of HDMI, VGA, audio in, and audio out. There is no built-in USB hub, though it does have a pair of 3W speakers for basic audio chores. It also brings a modicum of ergonomics to the table with a stand that supports tilt adjustment. The $75 gift card is really what makes this a deal. With that in play, it's a relatively inexpensive upgrade. Alternately, if you're looking to buy a cheap monitor for someone else, you can gift the S2316H and keep the gift card for yourself. Go here to grab the monitor and gift card combo.